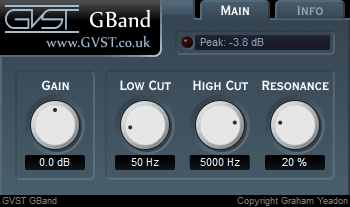 GBand is a resonant band-pass filter. A typical band-pass filter is configured by selecting a central frequency "node" and adjusting the Q (width) of the band surrounding the node. GBand operates in a much more intuitive way. It is actually composed of a low-cut and a high-cut filter operating in series. In GVST terms, this plug-in is identical to having a GLow and GHi running one after the other. All GVST plug-ins come compressed in a ZIP file, so the first step is to extract the files from the ZIP file. Once extracted, you should have one or more DLL files, these are the plug-in files. You need to copy the plug-in files to the appropriate folder for your host program. In most cases, you will need either to restart the host program or re-scan the plug-in folder in order for newly-installed plug-ins to appear. Automating the Frequency and Resonance parameters can help add life and drama to an individual track, a sub-mix, or even segments of a song at mix-down. With a 0% resonance setting, GBand can be used to restrict the frequency range an instrument or track occupies, without colouring the sound. Each knob is laid out the same way for consistent and easy reference. Above each one, its function is labelled. Below each one is a numerical readout of the value assigned. One additional mini-window at the bottom of the GUI shows the peak level of the incoming signal, in decibels. Gain: This knob adjusts the input (rather than output) level. On GBand, at least, the end result is identical either way. Surely a gain knob needs no further explanation! Lo Cut: Only frequencies above this level will be allowed to pass through. Anything below is cut. Hi Cut: Any remaining frequencies below this value (after the Lo Cut has already subtracted some) are passed through. Any frequencies higher than this knob's setting are cut. Res: This knob sets the "resonance", for both filters. Resonance is created by boosting a small band of frequencies at the two filters' cut off points. Peak Display: In addition to your usual methods of metering, this small window gives you a quick look (peek?) at how "hot" the output audio is. This is useful as resonance can create considerable peaks in the output. GVST plug-ins are provided to the user at no cost. While every GVST plug-in is tested to the best of the developer's ability, no warranty or guarantee is offered to the end user. No suggestions made by the developer or his representatives (i.e., freely offered support) are to be taken as an implied warranty or guarantee. These plug-ins may only be distributed by the official GVST website, or by parties explicitly given permission by the developer. GVST plug-ins are to be distributed only in their original form as intended by the developer (i.e., the unaltered archive). GVST plug-ins are freeware, meaning you are never under any obligation to pay for them! However, should you wish to help support continued development of GVST software, please consider donating through the official website. Development, code, website and graphics by Graham Yeadon. Documentation by Greg Pettit and Graham Yeadon (many thanks to Greg for all of his help). VST technology copyright Steinberg GmbH. The "VST" name and logo are registered trademarks of Steinberg GmbH. "Windows" is a registered trademark of Microsoft Corporation. "Mac" and "OSX" are trademarks of Apple Inc. Copyright Graham Yeadon. E-mail me at graham@gvst.co.uk. I would not make software available that I did not feel was safe and stable. However, I cannot take responsibility for any damage, difficulty, or stress caused by use of my software. Please do not download any software unless you agree with the license conditions. VST and Windows are trademarks of Steinberg and Microsoft respectively.